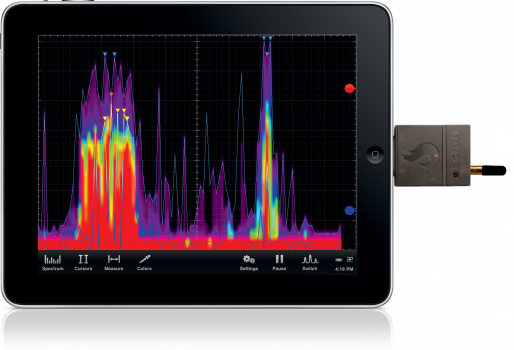 Oscium has unveiled a breakthrough product line for the iOS Test industry that enables iPad, iPod touch, and iPhone to now become either a spectrum analyzer or a dynamic power meter…or both. Oscium’s first-to-market product, iMSO-104, successfully merged a mixed signal oscilloscope and the iOS family of products using the 30-pin dock connector. The contribution was so significant that Cypress Semiconductor Corp heralded the product as ‘revolutionary’. Oscium’s new product line, called WiPry, is the next installment in modular test equipment. This new category of test equipment has the potential to change the benchtop dominated landscape by establishing the touchscreen-based iPad (or iPhone, iPod touch) as the new user interface. This platform presses the refresh button on the antiquated buttons and knobs of benchtop instruments while at the same time offering mobility that PC-based instruments can’t match. Three distinct products fit under the WiPry brand: WiPry-Spectrum, WiPry-Power, and WiPry-Combo (which combines the functionality of both WiPry-Spectrum and WiPry-Power). WiPry-Spectrum leverages the colorful potential of the OpenGL interface on the iOS platform for stunning real-time views of RF activity in the 2.4GHz ISM band. WiPry-Power crosses the chasm of this new platform by not only graphically displaying RF data from 100-2.7GHz but also adding the ability to capture, trigger and record the actual power output of RF amplitude. An optional accessory kit is also available that boosts the products ability by giving the user the ability to make conducted measurements. The final product combines all the features of both WiPry-Spectrum and WiPry-Power into one product called WiPry-Combo. All three units in the WiPry product line are available for preorder with an expected shipping date of October 7, 2011. WiPry-Spectrum is $99.97, WiPry-Power is $149.97, andWiPry-Combo is $199.97. More information can be found at www.oscium.com. WiPry is compatible with all generations of iPod touch, iPhone, and iPad devices running iOS version 3.1.3 or higher. It is made for: iPod touch (1st, 2nd, 3rd, and 4th generation), iPhone 4, iPhone 3GS, iPhone 3G, iPhone, iPad 2, and iPad. Oscium delivers innovative test equipment that leverages the easy-to-use interface of the iPad, iPhone, and iPod touch. As an MFi-approved developer, Oscium interfaces with the iOS family of products through the 30-pin dock connector, making our design both convenient and practical. Using the best in touchscreen-based technology, Oscium is making cutting edge test equipment more intuitive and easy to use. Oscium has created a new category in test equipment called iOS Test with the following first-to-market offerings of iOS test equipments.